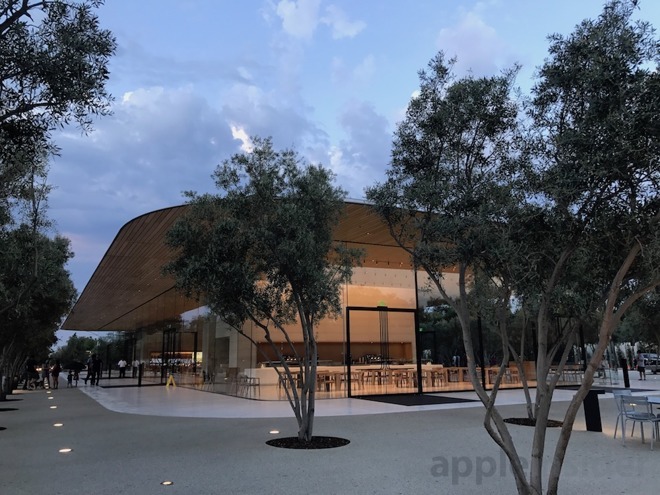 Tomorrow, Apple will be introducing a series of new products at its brand new Steve Jobs Theater, in the first occasion for outsiders to visit its Apple Park campus. In parallel, it appears ready to show off its $80 million visitor center, which was first detailed in the summer of 2015, nearly four years after the "Campus 2" was first announced. When Steve Jobs first laid out plans for the new campus, city government leaders asked whether Apple might also build a retail store in Cupertino., or perhaps fund WiFi for the entire town. Jobs did not appear pleased. However, shortly after Apple hired Angela Ahrendts as its senior vice president of retail, the company converted its "company store" at the Infinite Loop headquarters from a visitor center of sorts selling Apple-branded clothing, pens, cups and other trinkets into a full retail store selling the products Apple actually makes. It didn't, however, ever really create a place for visitors to learn about Apple itself. 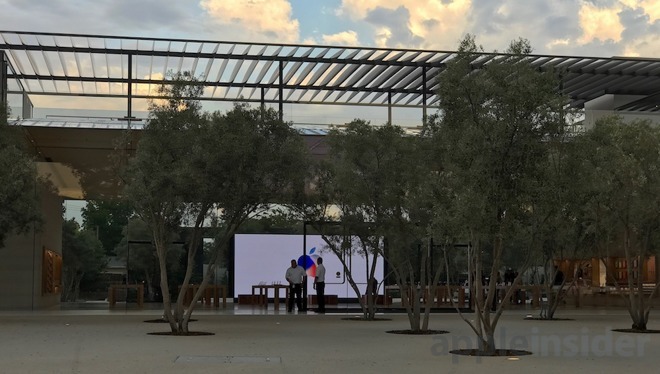 However, as it puts the finishing touches on Apple Park the company is also getting ready to open its first major welcome center for tourists, featuring a retail store, a cafe and rooftop deck providing a view of overlooking the Apple Park Spaceship across the street. Above is a street level panorama taken earlier today (on Monday), just as the 95 degree day in Cupertino, California broke loose with unusual rain and loud bursts of thunder and bright flashes of lightning that are quite rare in the San Francisco Bay Area. Plans first published by the Silicon Valley Business Journal based on company filings in the summer of 2015 described a two-story center with a 2,386-square-foot cafe and 10,114-square-foot store, topped by a carbon fiber roof and observation deck situated 23 feet above ground level, with 684 underground parking spaces. Apple planned to operating the new visitor center from 7 a.m. to 7 p.m. on weekdays and 9 a.m. to 7 p.m. on weekends. Additional details appeared at the beginning of 2016, when it was revealed that the building itself would cost $80 million, on top of an estimated $26 million for its underground parking structure. Apple reportedly paid $4,000 per square foot for the building, more than double the $1,500 per square foot price tag for the overall project. Viewed from the street corner, building is spectacularly beautiful. It features solid glass walls with rounded corners, providing panoramic views into the central segment that serves as a typical modern Apple Store (below top), complete with a massive video wall (below bottom). There are no trees inside the building, but it appears that there are, because the front and back are fully transparent walls of glass, allowing you to see through the building, which is flanked on both sides by perfectly centered rows of what appear to be olive trees. The south end of the building features a cafe with indoor seating facing a white expanse of surrounding paving suitable for outdoor seating (as shown in renderings). 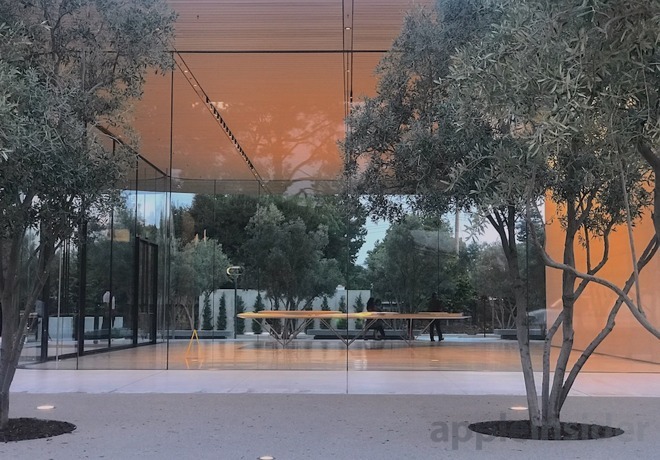 The opposite end of the building features a similarly sized, atrium-like room containing a topographical model of the Apple Park site for visitors to examine. 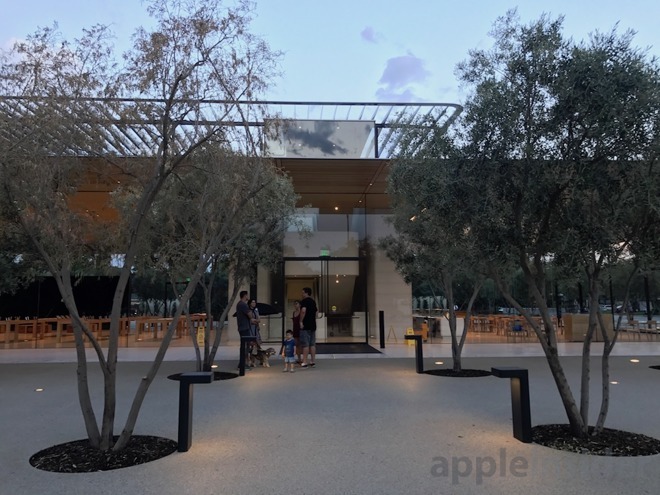 On either side of the retail space, there are stone stairways that provide access to the roof top deck, which provides a view over the Apple Park site. From the sidewalk, the massive "Spaceship" ring is only partially visible, nestled behind berms of earth covered with vegetation and trees. You can tell the building is massive, but you can't actually see much of it. It's also hard to see much of the top of the Steve Jobs Theater. 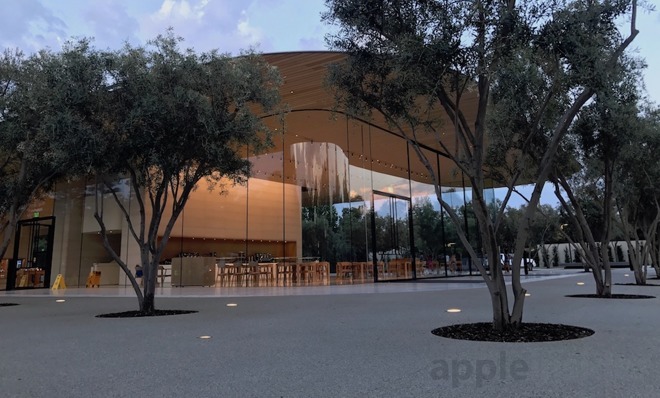 It's still unknown whether Apple will host public events inside the Steve Jobs Theater, but as readers have noted, as the company enters into the TV and movie production business, it may also launch premiers of the shows it funds. At this summers' Worldwide Developer Conference, Apple presented an early look at "Planet of the Apps," as well as hosting public presentations by public figures including Michelle Obama, as well as Dr. Christine Darden, Todd Stabelfeldt and Miral Kotb, each of whom shared their personal experiences in overcoming seemingly impossible obstacles through the application of technology and their own persistent determination. Looking at the site from behind the visitor center, you can feel the enormity of the Spaceship building, even though it is mostly enshrouded by trees. From the top of the visitor center's roof, viewers will have a less obstructed view. 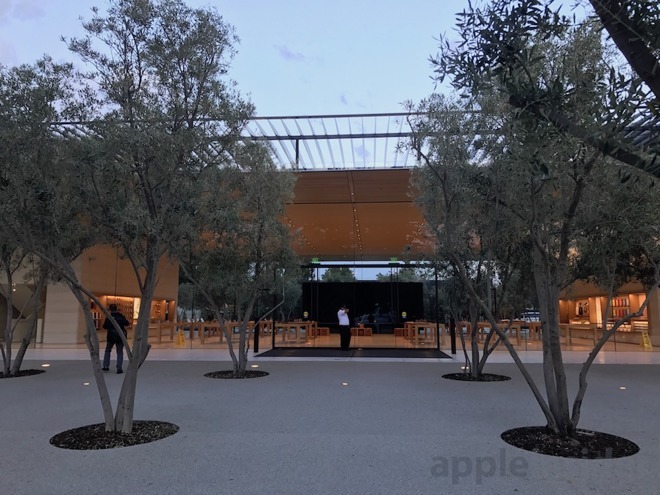 Also visible in this photo are the oval ring street lamps that are found through Apple Park. 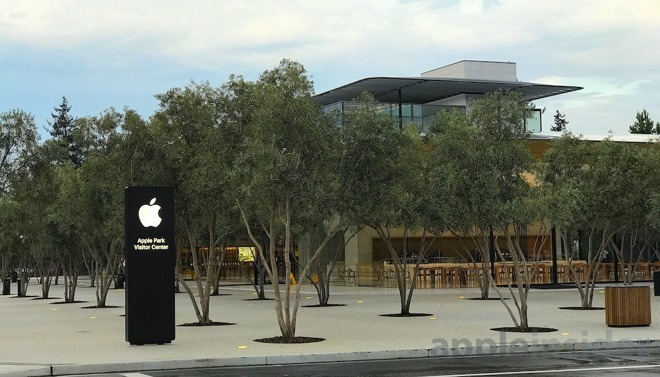 Late in the day, crews were blocking off Tantau Street with barriers in preparation for the iPhone X event tomorrow, where members of the media are invited to see Apple's latest gear, including an expected new Apple Watch, AirPods, 4K Apple TV and more details on the HomePod first introduced at WWDC this summer.